Lawyers for a Massachusetts man sentenced to life in prison in the 2007 killing of a high school classmate have asked the state's highest court to grant their client a new trial. Lawyers for a Massachusetts man sentenced to life in prison in the killing of a high school classmate in 2007 have asked the state's highest court to grant their client a new trial. John Odgren was convicted in 2010 of murder in the stabbing death of 15-year-old James Alenson in a bathroom at Lincoln-Sudbury High School. Odgren was 16 at the time. 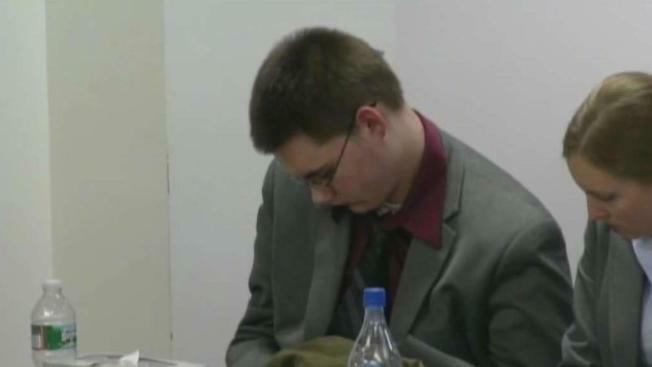 The jury rejected Odgren's arguments that his Asperger's syndrome and mental issues health issues contributed to his actions. Odgren's attorneys argued Monday before the Supreme Judicial Court that jailhouse phone calls in which Odgren laughed about the case shouldn't have been played to jurors. They want either a new trial or a reduction in sentence to manslaughter. Prosecutors call the defense's arguments "meritless."